The 2nd volume of this collection!! 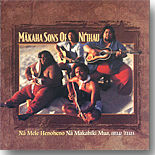 This CD covers music from three Makaha Sons of Ni'ihau albums, "Ke'ala", "Makaha Sons of Ni'ihau", and "Mahalo Ke Akua". It covers the period of time from 1978 through 1981. They performed often at Hank's place in Kaimuki, at the Ala Moana Hotel and at the Ranch House in 'Aina Haina. They also traveled widely giving concerts on the west coast and Tahiti. They were quite a picture: a group of young Hawaiians, including two very large members, whose music was pure and beautiful, highlighted by the voice of young Israel. His was the voice that was the essence of the Makaha Sons of Ni'ihau. The group became known for their uncompromising devotion to Hawaiian music and Hawaiian values. Israel's older brother Skippy was the leader and spokesperson for the group. He articulated their philosophy of music that which comes from the heart, and he personified the big heartedness of the band. Skippy was a very spiritual, charismatic person who commanded the stage; his message: Hawaiian pride in music and culture. Little attention was paid to appearance as they believed the audience loved their carefree, laid back style. As Skippy said, "This is who we are...and we are Hawaiian." In the fall of 1982, at the age of 28, leader Skippy Kamakawiwo`ole died tragically from a massive heart attack. Skippy's death brought an end of an era for the Makaha Sons of Ni'ihau. Throughout their career, from 1976 through 1993 the Makaha Sons of Ni'ihau never wavered in their mission: to promote and perpetuate the music of Hawai'i.